Are you a local golfer? Does golfing ever make your back hurt? If so, it's fairly common. Research shows that almost 30% of golfing novices stop playing due to lower back pains, and the Titleist Performance Institute estimates 23% of professional golfers and 28% of all golfers deal with low back pain after every round. In our last few posts we talked about the reasons your back may hurt from playing golf. In part one, we covered disc injuries, sprains, and strains. The second part covered fractures, arthritis, and more. In the next phase of this series, we're going to focus on prevention tips. Do you think you could benefit from the best chiropractors in Raleigh NC to help you with your aches and pains from playing golf? Keep reading to see how Falls Chiropractic and Injury can help you feel better. Preventing a back injury from playing golf starts with warming up. This means that you should not just roll out to your tee time, or the driving range and start crushing golf balls. You'll probably suffer a pulled muscle, or worse. We suggest that you spend several minutes warming up by stretching and taking several easy swings. This will get your muscles ready for the activity. Stretch first. Focus on your shoulders, torso, hips, and hamstrings. You can use your golf club to stretch your shoulders and torso. Hold it behind your neck and shoulders and then rotate your body back and forth. Stretch your hips by pulling your knees up to your chest, and your hamstrings out by bending over and trying to touch your toes. Never strain, and stop if you feel pain. After you stretch these muscle groups, take several gentle swings with a light club. This will prepare these muscles groups for the torquing and twisting a hard golf swing creates. If you have the extra time, go to the driving range first. It will help your body prevent injury, and improve the score of your golf game. 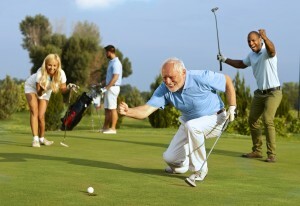 Once you have your muscles stretched out, you are much less likely to suffer a golfing injury. A good warm up can take lots of stress off your back and prevent it from being strained or sprained. For more pain prevention tips, be sure to check out our next blog post. We'll cover more ways to avoid back pain from playing golf. If you're ready to start feeling better maybe we can help. Keep reading to learn more about our services. If you need help treating back pain or suffering from a golfing injury, maybe it's time to talk to an expert! The gentle treatments that our type of chiropractic care provides is specifically designed so you will regain your range of motion and improve flexibility. So if you are ready to start playing better, call Falls Chiropractic and Injury today! We are chiropractors in Raleigh NC that specialize in drug free treatment for your back aches and pains. We are some of the most well-trained treatment providers that you can consult with for reducing your neck, shoulder, hip, or back pain. We can also help you plan a great diet so you're getting the nutrition that your body needs to heal naturally.